Let your creativity take flight with EverSewn. EverSewn sewing machines give you the creative freedom to bring your imagination to life. Beautifully and thoughtfully designed with ease of use in mind, the EverSewn Sparrow Series offers amazing quality and a wide variety of functions with a very attractive price tag. So take charge of your creative dreams and make something beautiful. It's about fashion, family, your style - it's about you. 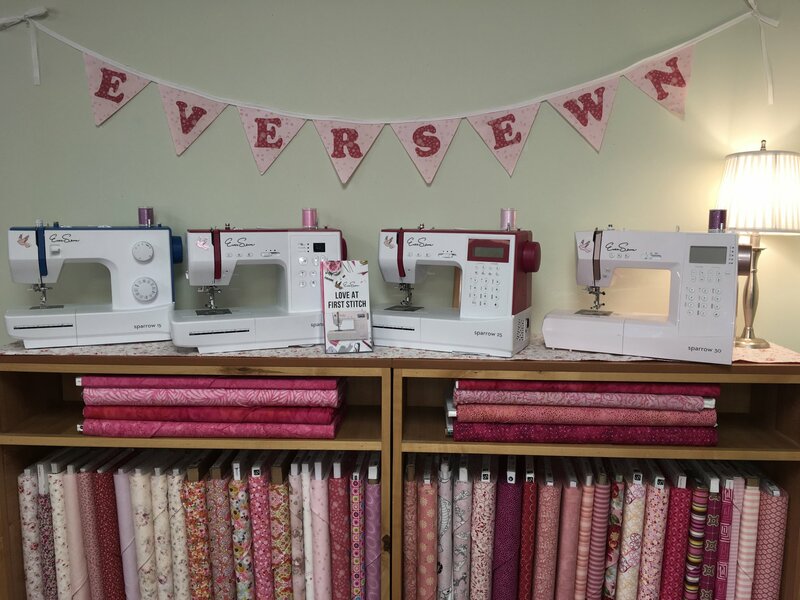 Try an EverSewn Machine and you'll be ever sewing with EverSewn. The EverSewn Sparrow 15 is a mechanical model with computer control. The stitch package features 32 stitches including a buttonhole with a maximum stitch width of 5mm. The two knobs on the front of the machine and the wheel on top can be used to set thread tension or stitch length, as well as to select stitches. The manual needle threader and the thread cutter help you sew efficiently. Four presser feet come standard with the EverSewn Sparrow 15. Full metal parts inside yet light enough to carry to your next class or retreat. The EverSewn Sparrow 20 is a computerized model for ambitious sewers. The stitch package includes 80 stitches with a generous maximum stitch width of 7mm and 15 needle positions. The practical start/stop function lets you control the stitching process without using the foot pedal. The needle position up/down function allows you to specify the needle position at the end of a row of stitching - a big advantage e.g. when stitching corners. In addition, the sewing speed can be adjusted according to the fabric or the difficulty of the detail being sewn. The EverSewn Sparrow 20 includes as standard seven presser feet. Full metal parts inside yet light enough to carry to your next class or retreat. The computer-controlled EverSewn Sparrow 25 is a great model in this series. It offers everything a creative sewer could need, at a very attractive price/performance ratio. The Sparrow 25 boasts 197 stitch patterns in total, including 1 alphabet, 7 buttonholes, and 1 eyelet stitch. Decorative stitches can be set up to a width of 7mm, as desired. The memory function allows individual stitch combinations to be saved. In addition to features such as a slide speed control, start/stop function, and needle stop up/down, the EverSewn Sparrow 25 also has a bright sewing light. Seven presser feet come standard with this model. The full metal parts do not weigh this machine down making it ideal to bring with you on your next trip. Joining the Sparrow series is the new computer-controlled EverSewn Sparrow 30. It offers creative freedom with a pleasing price/performance ratio. The Sparrow 30 boasts 310 stitch pattern in total, including 32 utility, 84 decorative, and 2 full alphabets. Decorative stitches can be set up to a width of 7mm, as desired. The memory function allows individual stitch combinations to be saved. With the push of a button, the Sparrow 30 cuts your thread automatically. In addition to features such as adjustable presser foot pressure, sewing speed control, start/stop function and needle stop up/down, the EverSewn Sparrow 30 also includes seven standard presser feet and an extension table. Just like the other Sparrow series machines, the Sparrow 30 is built with full metal parts and is light to carry. Enjoy a full line of companion EverSewn Notions from specialized feet to pins. A sampling is on the online Shop or visit the shop to see what the excitement is about. Purchase your EverSewn Sparrow at the shop today to learn more.